This post contains affiliate links. You can read about my disclosure policy here. When it came time to create a baby registry, I went with Amazon. For better or for worse, Amazon has successfully ensnared me in their clutches (I just renewed my Amazon Mom Prime membership) and I don’t know if I’ll ever be free. Amazon generally offers the lowest prices, tends to have reviews on all their products, and has blazing fast shipping. 1. I didn’t register at any of the big box baby stores because I hate buying things at full retail when I know I can get it cheaper online. It’s the one area I’m a total scrooge. 2. When I do make purchases online, I hate paying for shipping. Amazon offers free two-day shipping for Prime members. Non-Prime members still receive free shipping but only on orders over $25. 4. 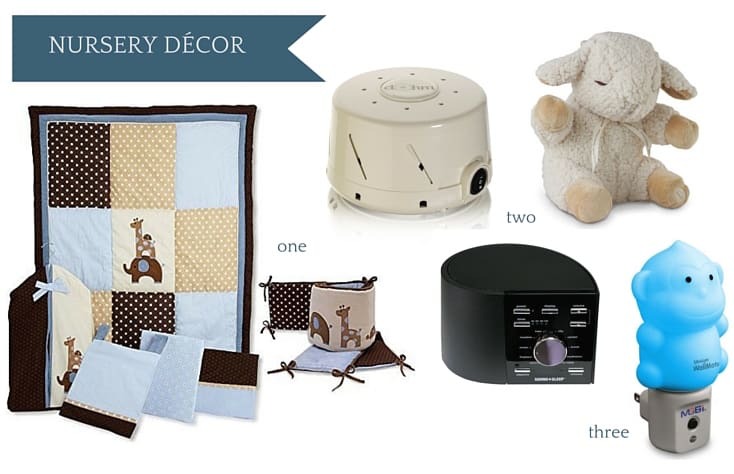 Amazon has a free 90-day return policy for baby registry items. I don’t know about you, but I live in NYC and it’s a pain for me to get to a Buy Buy Baby or Babies”R”Us. I had to plan time for a trip to return some items at one of the stores. And I didn’t really want to buy anything with the store credit I received because, like I said, I hate paying full retail! Bonus: If you end up returning any Amazon products, you can use the credit to buy virtually anything – not just baby items. 5. My absolute favorite part about the Amazon baby registry is this: Amazon offers a 10% completion discount on items remaining on your registry up to 60 days before your child’s arrival date (or up to 180 days after). Plus, if you become an Amazon Mom Prime member, you receive a 15% completion discount!! (Yes, that is how I got sucked into becoming a Prime member.) Since Amazon prices already tend to be lower than other retailers, this is an AMAZING deal. BONUS: Amazon now offers a Welcome Box for Prime members that have over $10 of purchases from their registry. The Welcome Box has a retail value of $35, which you can purchase as well, and is reported to contain sample and full-sized baby products. 1) The discount can only be used on up to two orders for a combined total of no more than $2,000.00, so plan your registry and final purchases wisely. 2) The discount only applies to products that are sold by Amazon.com. 3) The discount only applies to baby-related or maternity items. Books, even baby-related books, do NOT fall under that category. Trust me, I tried to make that argument with customer service. 4) If you sign up for Amazon Prime for the 15% completion discount but then cancel your Prime membership, the discount will revert to 10%. This is my two cents: Yes, it may seem greedy when you register for an $800+ UPPAbaby stroller. But, in reality, when no one buys it for you and you use your 15% completion discount to save over $100 on a stroller that never goes on sale, WHO CARES WHAT OTHER PEOPLE THINK. *I organized the products based on Amazon sub-categories. The products that I linked are all items I either received through my registry or personally purchased on a later date. 1. Wash cloths – aden + anais Muslin Washcloths – I love aden + anais products. The wash cloths are the perfect size and super soft. 2. Baby bathtub – PRIMO EuroBath – Be prepared for a gigantic baby tub. Only get it if you have the extra space. You can bathe a newborn in a large sink. Or, better yet, get in the tub or shower with your baby and hold him/her while washing. This usually results in the fewest tears. Just watch out because wriggly wet babies are slippery! 3. Baby shampoo – California Baby Calendula Shampoo and Body Wash – I love this non-toxic shampoo and body wash. Extra gentle, smells good, and doesn’t seem to sting the eyes. 4. Baby lotion – Aveeno Baby Eczema Therapy Moisturizing Cream – Neither of my kids had eczema but it’s also great for dry skin. 1. Mattress – Naturalmat Coco Mat (read my review here) – One of the most non-toxic baby mattresses on the market. 3. 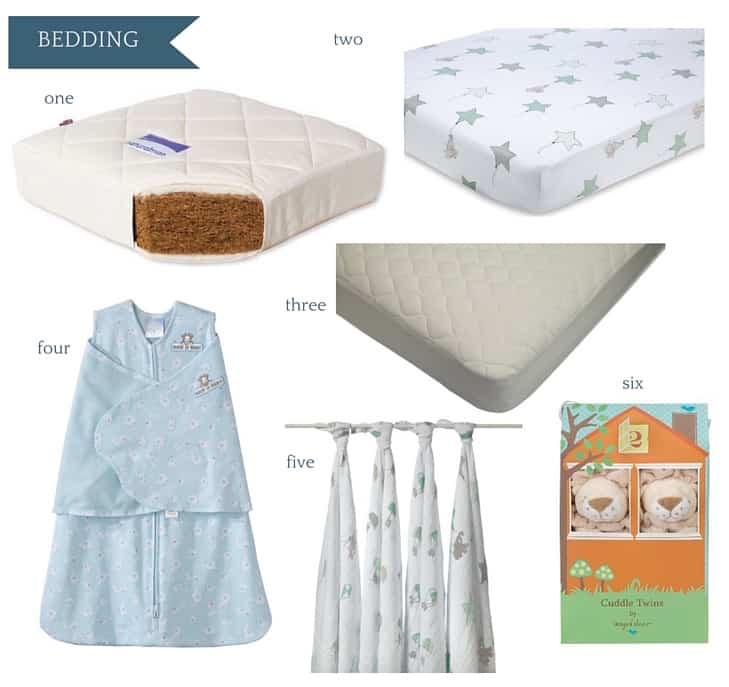 Waterproof mattress cover – American Baby Company Organic Waterproof Quilted Crib Pad Cover – I would get two since you need at least one extra for when accidents happen. 4. Sleep sack – HALO Sleep Sack or Zipadee-Zip (read my review here) – The Zipadee-Zip is NOT available on Amazon but I had to mention it since I love it more than the HALO Sleep Sack. You learn some new tricks with a second baby and Alexa has been using it since she was 3 months old. 5. Swaddle blankets – aden + anais Muslin Swaddle Blanket – Don’t overdo swaddle blankets. You will receive a lot of receiving blankets as gifts. I had two sets and ended up never using the second one. 6. Security blanket – Angel Dear Cuddle Twin Set – I love this as a super cute and soft security blanket. 1. 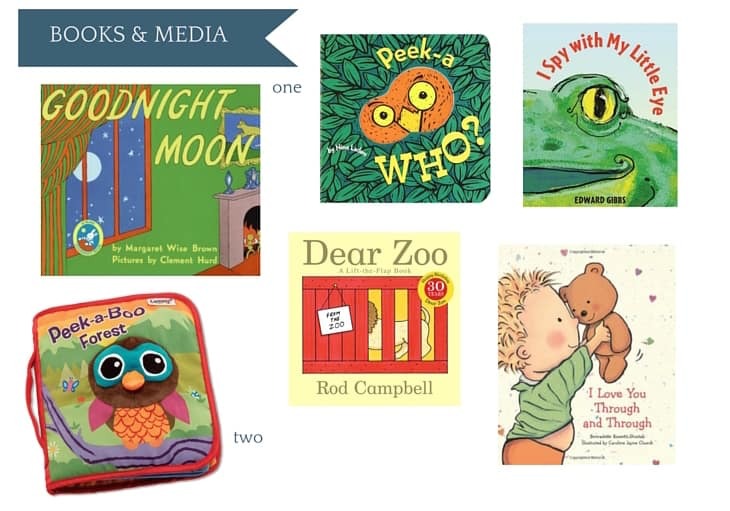 Books – I registered for a lot of books but here is a list of my Top 5 Books to Read to Baby. 1. Infant car seat – Graco SnugRide 30 Classic Connect Car Seat – UPPAbaby used to make a car seat adapter that you could use to snap into other manufacturer’s car seats into their strollers. It appears that the converter has since been discontinued. If you decide to use an infant car seat, either get one that is compatible with your stroller system or get a stroller frame like this one. It is worth noting that, with the second baby, I used a hand-me-down infant car seat (from a trusted source and no prior accidents) and transitioned her to the convertible car seat at 3 months. 2. Convertible car seat – Peg Perego Primo Viaggio SIP 5/70 Convertible Car Seat (read my review here) – I now own two of these car seats: both the leather-trimmed and regular version. The leather one looks awesome but only get it if you don’t care about $50. 1. Diapers – Pampers Swaddlers – If you register for diapers, choose size 1. I received a case of 240 newborn diapers. Max wasn’t a large baby but we still ended up with a few bags leftover. 2. 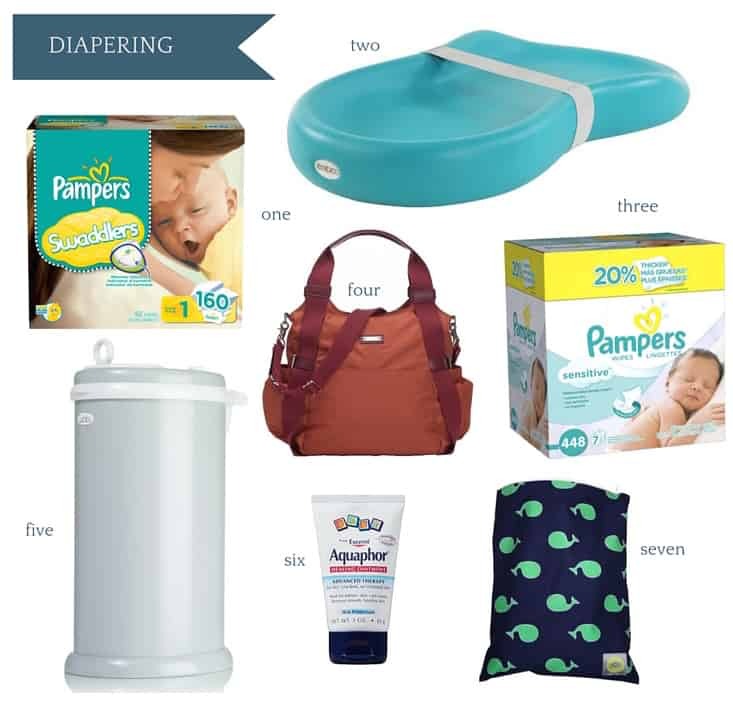 Diaper changing pad – Keekaroo Diaper Changing Pad (read my review here) – As a second-time mom, I can tell you, diaper changing pads aren’t a necessary purchase. You can just throw down a pillowcase and change your kid on it (we do for our second baby.) BUT, if you must have a diaper changing pad, the Keekaroo is THE BEST. We still use it daily for our son and it looks brand new. However, second-child syndrome means the baby uses one of those travel pads that come as a bonus when you buy a diaper bag. 3. Baby wipes – Pampers Sensitive Wipes – These wipes are thick, moist, and gentle on the skin. No complaints. 4. Diaper bag – Storksak Tania Bee Diaper Tote Bag – This bag looks pretty glam but is another one of those things that I shouldn’t have bought. Get a nice big backpack with lots of pockets + a travel changing pad. Done. 6. Diaper rash cream/ointment – Aquaphor Baby Healing Ointment Diaper Rash and Dry Skin Protectant – Recommended by the pediatrician and has helped prevent both my babies from ever having diaper rashes. 7. Wet bag – Itzy Ritzy Zippered Wet Bag – Great to have in the diaper bag for when you are out and have soiled clothes. 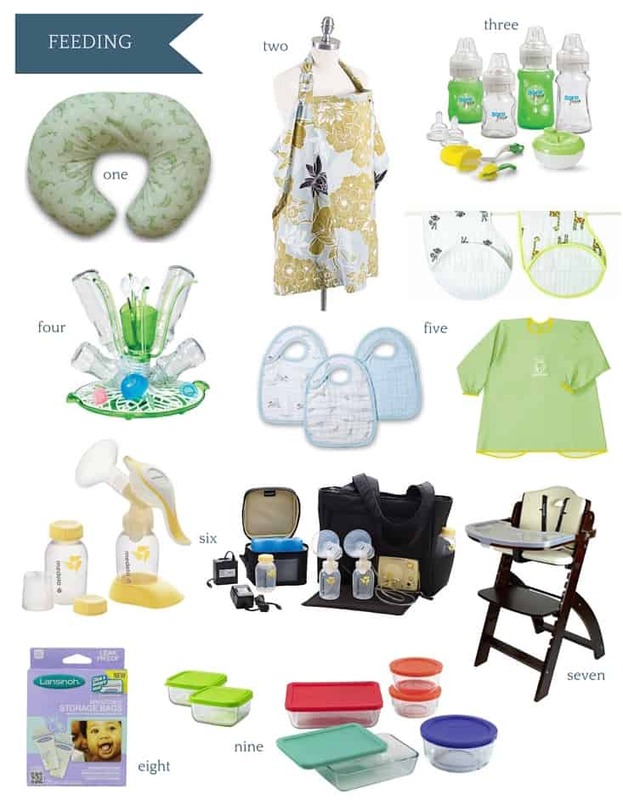 *Some of these items are only for moms who plan to breastfeed/pump. 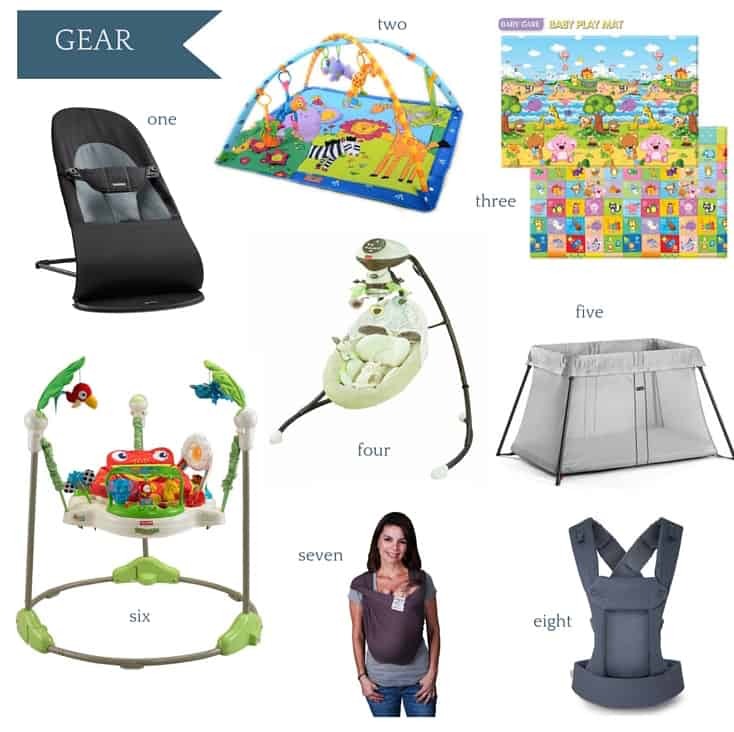 If you would like to breastfeed, also check out my Ultimate Breastfeeding Gear Guide for all the gear you will ever need to breastfeed. 1. Nursing pillow – Bobby Pillow – I also have the slipcover and water-resistant protective cover – Throw pillows work too. 2. Nursing cover – Bebe Au Lait Nursing Cover – I use (and prefer) the Curasanas Nursing Scarf now. 4. Bottle drying rack – Munchkin Sprout Drying Rack – A nice and simple rack. Exactly what you want in a drying rack. 5. Bibs – aden + anais Muslin Burpy Bibs, aden + anais Snap Bibs, and BabyBjorn Eat & Play Smock (read my comparison review here) – Get a lot of bibs. Babies are messy. Babies drool. 6. Breast pump – Medela Pump in Style Advanced Breast Pump and Medela Harmony Manual Pump – Check with your insurance company first because most insurance policies now offer free breast pump options! Surprisingly, I ended up using the manual pump more. It is more time-consuming but the manual pump allowed me to feel more in control and, as a result, was more tolerable. 7. Breastmilk Storage Bags – Lansinoh Breastmilk Storage Bags – Pro-tip: make sure to get out as much air as possible when sealing the bag. Then freeze on a flat surface for easier storing. 8. High chair – Abiie Beyond Junior Y Chair – I used this high chair but there are probably better options out there. 9. Food storage containers – Innobaby The Glass Baby Food Storage Cubes and Pyrex Storage Set – I prefer glass or Pyrex storage containers for baby food. 1. Bouncer – BabyBjorn Babysitter Bouncer Balance – I also have the wooden toy – I used this bouncer for both of my kids and they both loved it. 2. Activity gym – Tiny Love Lights and Music Gymini Activity Gym – An activity gym is great for tummy and floor time. 3. Play mat – Baby Care Play Mat (read my review here) – I no longer recommend this play mat (even though I still use mine – ha!) Read my guide about non-toxic play mats for babies which helps to explain why. 4. Baby swing – Fisher-Price Snugabunny Cradle ‘N Swing – One of those things that every first-time parents get but may or may not work for their baby. It did not work for mine but you won’t know until you try! 5. Travel crib – BabyBjorn Travel Crib Light – you can also get the organic fitted sheet for the mattress – We used this crib a lot for travel. It folds up easily and is compact and light. 6. Baby jumper – Fisher-Price Rainforest Jumperoo – I don’t like jumpers. (I ended up barely using mine.) Too busy. Too noisy. Too chaotic. Bad for baby’s development. But also something most first-time parents just have to get. 7. Baby carrier wrap/sling – Baby K’tan Baby Carrier – Babywearing is an absolute must-have and lifesaver for me. 8. Soft-structured baby carrier – Beco Gemini Baby Carrier – When it comes to babywearing, I’m a soft-structured carrier fan. I love the Beco for newborns to about 3/4 months. Then, Kinderpack all the way (read my review here). 1. Nail clippers/scissors – Piyo Piyo Baby Nail Scissors – These are excellent, precise nail scissors for those razor-sharp baby talons. 3. Thermometer – Braun Ear Thermometer – A little too big for infant ear holes. You might want to consider using a this as a rectal thermometer for infants. However, awesome for older babies and beyond. My toddler loves getting his temperature checked with this! 1. Décor – Lambs & Ivy – I registered for a few pieces separately from Lambs & Ivy which were all absolutely adorable. 2. Sound machine – Marpac DOHM-DS, Cloud b Sound Machine Soother, and Ecotone Sound + Sleep Machine (for travel) – I do actually have all three. I even have a white noise app on my phone. White noise has proven to be invaluable in helping Max sleep well. Must-have a white noise machine/app of some sort! 3. Night light – MOBI Tykelite WallMate – Max played with this too much once he was mobile and I haven’t seen it since. 2. Baby monitor – Motorola Video Baby Monitor – An excellent baby monitor camera for right over the crib. 3. Baby camera – Dropcam Pro (read my review here). This company no longer exists. It’s the BEST baby surveillance camera but was bought by Google and rebranded as the Nest Cam. 1. Standard stroller – UPPAbaby Vista Stroller – This is the Cadillac of strollers. It’s an excellent, diesel, glide-over-every-bump stroller. Every single first-time parent will think they need one. And waste lots of $$$. You will probably read this and ignore me. But, you don’t need one. Baby wear and then use an umbrella stroller when your baby is old enough. If you heed my advice, you can thank me later. 2. Umbrella stroller – UPPAbaby G-Luxe Stroller – An umbrella stroller, on the other hand, is a must-have. Get a good one. Personally, I love the UPPAbaby umbrella stroller. 3. Stroller muff – JJ Cole Urban Bundle Me – Great to have for those cold winter days. I never have to worry whether or not I dressed the kids warmly enough. 4. Stroller organizer –Diono Buggy Buddy Stroller Organizer – Useful for holding drinks, keys, and small items. 5. Stroller hooks – Think King Mighty Buggy Hook for Stroller – These hooks are must-haves (depending on your stroller bars) if you ever plan on going shopping while pushing the stroller. 1. Music toys – Baby Einstein Take Along Tunes – Both of my babies have loved this musical toy. 2. Teethers – Vulli Sophie the Giraffe Teether – Because every parent you know will have this teether even though you have no idea why. 3. Bath toys – Boon Water Bugs – Look for bath toys that are seamless and don’t have holes in it. Rubber duckies grow mildew!! 4. Baby mirror – Manhattan Toy Wimmer-Ferguson Double-Feature Mirror – Babies love to see themselves. This is a great baby mirror. 6. Sorting/stacking toys – TOMY Little Chirpers Sorting Eggs Learning Toy and Spielstabil Nesting Stacker – These two toys are still played with by my toddler. I think that says a lot. 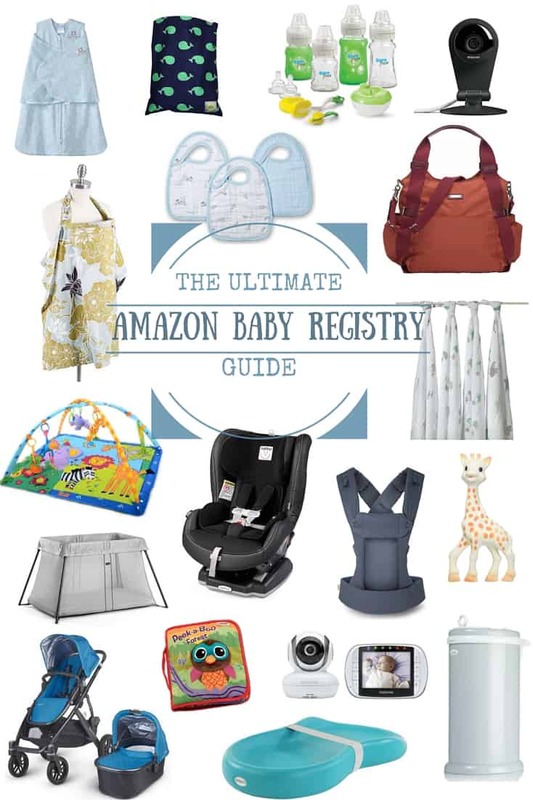 You can get started on creating your Amazon baby registry by clicking on the banner below! What are your thoughts on the items I listed? 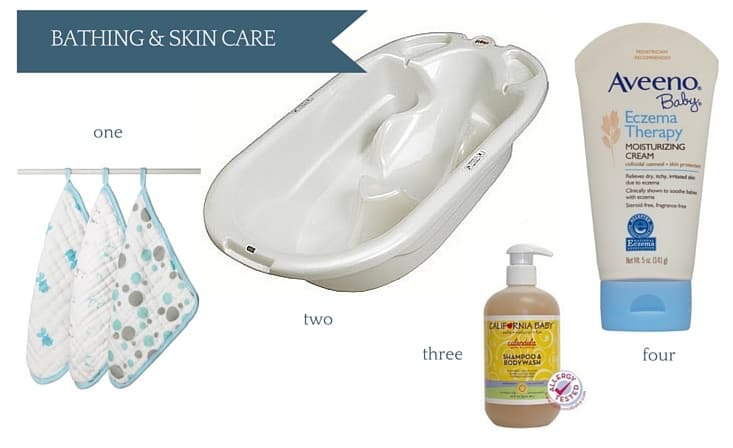 Is there a product that is an absolute must-have for your baby registry? If you liked what you read, please don’t forget to comment below, subscribe, and spread the love by sharing! This post was super helpful. I just added a bunch of things to my registry! Sarah, I’m so glad you found my post useful! Amazon’s baby registry is a gigantic joke! We were registered at Target & Amazon, and I thought Target’s was annoying (because some of the things would show up on the registry as a different size, they were constantly going out of stock once anything went on sale, etc. ), but I just put my order through for my registry completion discount with Amazon yesterday and saved… $1.77. Amazon only allows CERTAIN baby items to receive the discount. 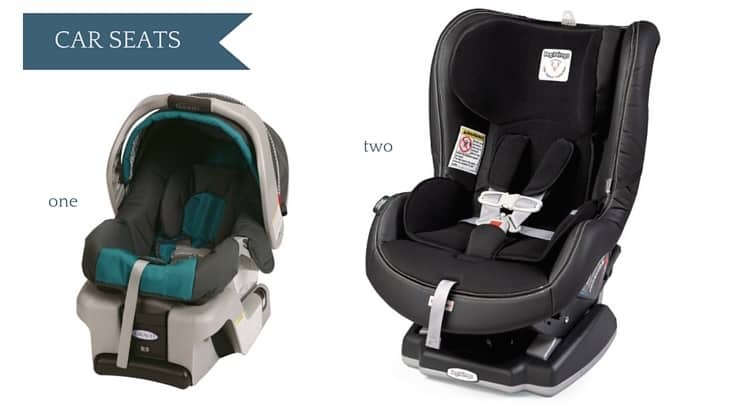 Car seats or anything that had a higher value was not included… why? No reason. You can only redeem the discount once (Target sent me out FIVE 15% off cards either to distribute to friends/family or to use myself on anything on my registry). You have to use the discount before the baby’s due date (with Target I can use those 15% off discount cards until November… I’m due in a few days – May). Also to get the 15% discount you have to sign up for Amazon Mom, which – watch out! You have to log a credit card so that the next month will cost you (P.S. they don’t say how much!). What new mom could possibly forget to unsubscribe from some easily forgettable rollover monthly charge? I’m so annoyed with Amazon. Spread the word – their registry is AWFUL and pointless. P.S. I haven’t even tried to return anything to Amazon (mostly because no one bought off my Amazon registry for whatever reason, maybe because they couldn’t pick up in store?) so I have no idea what that process is like but hope I don’t have to find out, because Amazon returns in general are no picnic. I’ve returned SO much from my Target registry (and even things that I didn’t have gift receipts for). Targets baby registry isn’t perfect but it is WAY more comprehensive, easy to use, easy to return, and worthwhile. Amazon’s is a joke. [As for Babies R Us, we got so many gift cards there but everything’s like double the price. Feels like wasted money to me]. I’m sorry you had such a terrible experience with Amazon. My experience was the exact opposite. I don’t know if their policies have changed, but I was able to receive a 15% completion discount for all baby items sold by Amazon. That may have been the catch for you – check to make sure that the items you wanted were actually sold by Amazon. Otherwise, I would speak to their customer service representative. I saved hundreds with my completion discount. But I also had some very high end items (e.g., organic mattress, Uppababy stroller) that were being sold through Amazon, so for me, it was totally worthwhile. I am also a Mom Prime member so I didn’t mind signing up with my credit card. I knew I intended to be a member (I save A LOT on diapers and other items that I buy monthly). I believe if you cancel your membership, your completion discount actually reverts back to 10%, so there is no point signing up if you don’t actually want to be a member. I have to agree that Target’s completion discount sounds amazing and returns are certainly easier at a store. However, I personally, did not feel the need to return many items and the things I did choose to return weren’t a big deal. The biggest thing for me was just the immense selection Amazon has over every retailer. I was pretty much able to find every single item I wanted in one place and I just thought it was easier that way. Obviously, if you can find everything you want at Target then that would probably work better for you! Either way, congratulations on your upcoming baby! I also had the exact opposite experience with Amazon. We got a $35 free gift of cool baby goodies, $100 in free diapers and 15% off ($300 off) of the rest of the $2,000 items on our registry. Hi Dee, thanks for the update. 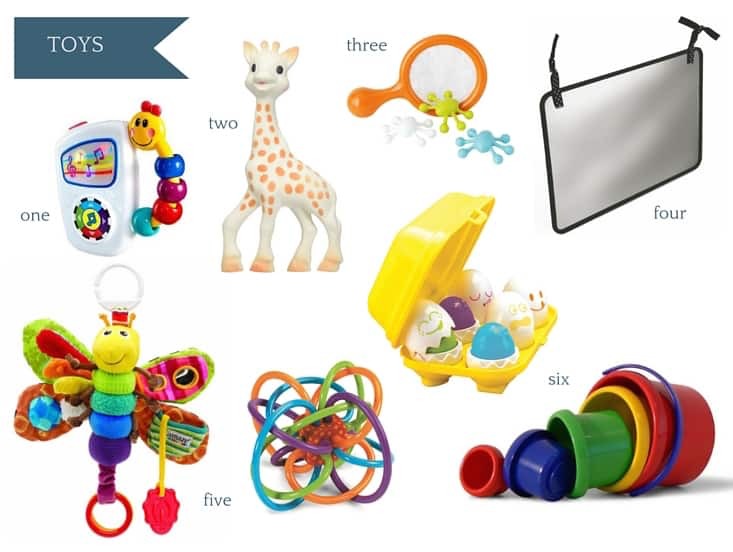 The Welcome Box is a new addition to Amazon’s baby registry benefits! Uppababy Vista no longer eligible for completion discount on Amazon – if the item is not shipped and sold by Amazon then item is not eligible. That has always been a requirement of the completion discount. Uppababy Vista is currently not sold by Amazon because it is being recalled for their bumper bars. I think that when the issue is resolved, they will be available through Amazon again. 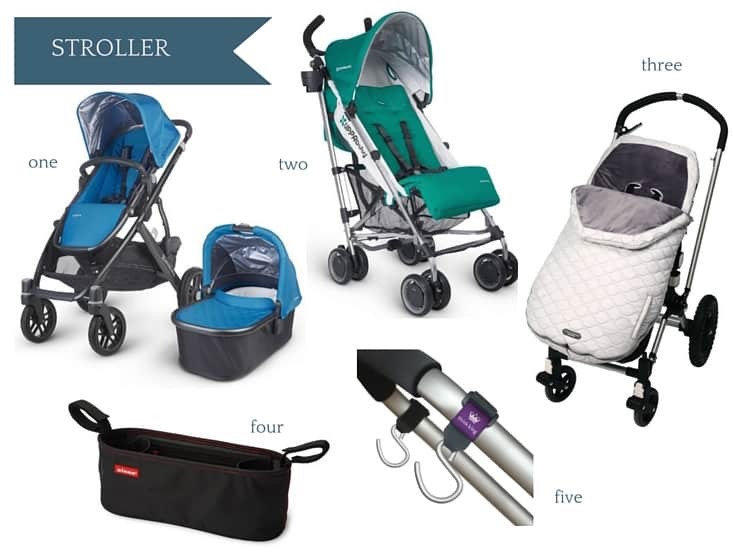 If you dont recommend the Uppababy as a must what other stroller do you recommend? Or how do you do it with the umbrella for 2 kids? So this is probably not conventional but we still baby wear! My 3.5 year old loves to be worn, when he’s tired or in a pinch, otherwise he walks. (It helps build stamina!) On longer outings, we’ll wear the younger one and have the older one in the stroller. We’ve really never missed the Uppababy Vista (have since sold it) but definitely couldn’t live without our umbrella stroller and carriers. But I know that this is not the norm. Uppababy came out with a double umbrella stroller that I would have seriously considered buying if our current arrangements didn’t work out as well as they did. Love this and <3 Amazon. I registered with Amazon as well (and published a post too!) and am so darn happy I did. You cannot beat that completion discount! The only problem I had was that there is so darn much out there on Amazon, I wanted to register for it all! When I first thought I finished my registry I had over 150 items (And that didn't count my Target Registry!) I had to swivel back around and go through asking myself, "Kayla, do you really need that?" with most items. I also didn't register for much clothing or toys on Amazon. Simply because I know that my family would prefer to shop for those smaller items. How can a buyer tell what has been purchased. I find the Amazon Registry cumbersome for the buyer. I purchase a lot on the net and this site could really stand improvement. It has no way to go back an look at items , it needs a preliminary basket where the items can be reviewed. Also it had a great suggestion portion and no way to get back to it. Maybe that is way few people bought off of one registrant’s site. If I had not waited to the last minute would definitely not use this site!! Did it work for you to use your 15% completion discount as a prime member on the uppababy products? Yes, as long as it says that it’s sold by Amazon.com. super helpful. great registry items. We found Dolce soft toys to be the best for tactile stimulation for babies. Thank you for the tip. Dolce toys look adorable! Hi Kylie, I wish I had tried out the DockATot – I’ve heard so many great things about it. Maybe I would have been able to put both babies down instead of wearing them 24/7! Also, thanks for the tip on renting some baby items. What a great way to save money! Some baby items are so expensive and short lived. Thank you for visiting my review blog, mommy blog and everything in between. I am a proud mommy of two and would love to share my experiences with you. So stick around, say hi back and don't be a stranger! 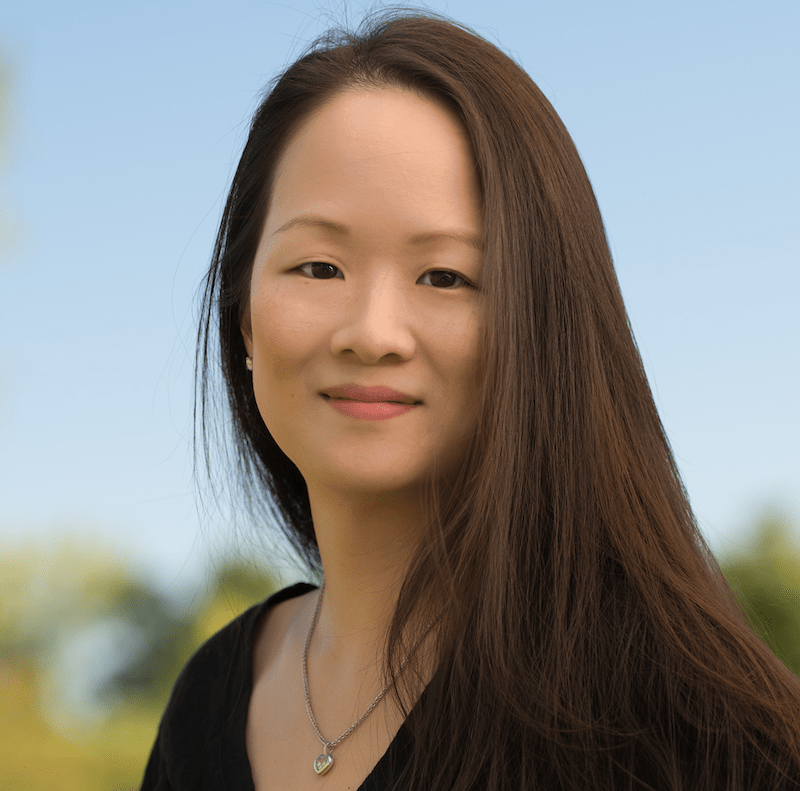 Don't miss out on future blog posts, giveaways, and reviews! Organic Start Giveaway + Coupon Codes! The Baby Mini Doc Project Giveaway! Mommy to Max Copyright © 2019.